Tour 2018. It takes place in May und June in ten cities – among others, in San Francisco, Frankfurt and Sydney. The tour is one of the most important events in the mobile sector covering all topics regarding enterprise mobility and mobile security. Points of discussion are the present technical, economical as well as social challenges in connection with data security of mobile workflows and sharing data. Attending CIOs, CSOs and business leaders will learn how to develop a holistic security strategy, with tools to enable boundary-free collaboration and best practices for digital business processes that will transform the way their organizations work. 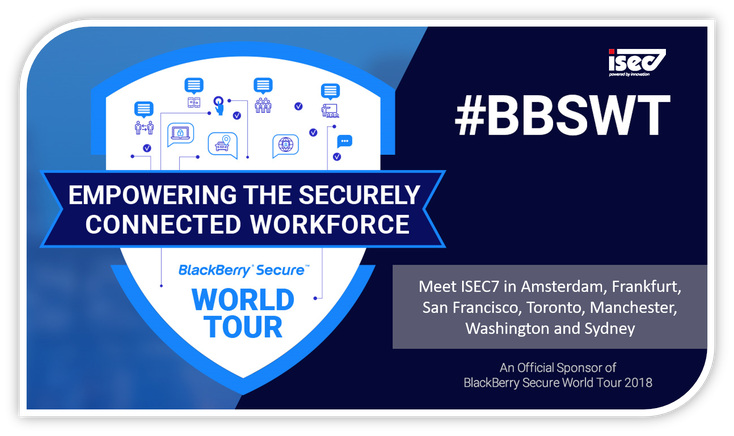 For more than 13 years, ISEC7 has been the strategic and globally active partner of BlackBerry offering services, software solutions and support for the BlackBerry Mobility Plattform to over 1,300 clients. ISEC7 is BlackBerry Shield Advisor and specialist for cyber security services as well as mobile forensics . Furthermore, the company has received the platinum status as one of the first partners of the „BlackBerry Enterprise Partner Program“.